Coltrane and jazz would never be the same. John Coltrane’s Prestige years began when he joined the Miles Davis Quintet in 1955. During the next few years, when he was either with Davis or the Thelonious Monk Quartet, he functioned as both leader and sideman for this label. These recordings document the first part of his relatively short but highly influential time in the spotlight. 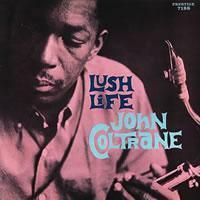 Lush Life contains Coltrane’s first recordings as sole leader, his initial date fronting a pianoless trio, and one of his first extended readings of a ballad, Billy Strayhorn’s resplendent title track. We also hear him at the helm of a quartet and quintet, featuring pianist Red Garland, with trumpeter Donald Byrd, bassist Paul Chambers and drummer Louis Hayes added to “Lush Life.” Coltrane handles the tune’s delicate complexities with infinite style and finesse. Lush Life, a combination of standards and a blues, treated in the unique Coltrane manner– sound wedded to material in a completely personal way–contains three tracks without a piano. This is the first time he recorded in this manner, other than when Monk was “strolling,” and it offers another aspect from, and of, Trane. Lush Life (1958) is among John Coltrane's best endeavors on the Prestige label. One reason can easily be attributed to the interesting personnel and the subsequent lack of a keyboard player for the August 16, 1957 session that yielded the majority of the material. Coltrane (tenor sax) had to essentially lead the compact trio of himself, Earl May (bass), and Art Taylor (drums). The intimate setting is perfect for ballads such as the opener "Like Someone in Love." Coltrane doesn't have to supplement the frequent redundancy inherent in pianists, so he has plenty of room to express himself through simple and ornate passages. Unifying the slippery syncopation and slightly Eastern feel of "I Love You" is the tenor's prevalent capacity for flawless, if not downright inspired on-the-spot "head" arrangements that emerge singular and clear, never sounding preconceived. Even at an accelerated pace, the rhythm section ably prods the backbeat without interfering. A careful comparison will reveal that "Trane's Slo Blues" is actually a fairly evident derivation (or possibly a different take) of "Slowtrane." But don't let the title fool you as the mid-tempo blues is undergirded by a lightheartedness. May provides a platform for Coltrane's even keeled runs before the tenor drops out, allowing both May and then Taylor a chance to shine. The fun cat-and-mouse-like antics continue as Taylor can be heard encouraging the tenor player to raise the stakes and the tempo -- which he does to great effect.